The global market for non-ionizing radiation/EMF detection, measurement, and safety derive much of its growth from the growing uptake of these devices across various sectors, such as the residential, medical and healthcare, manufacturing, laboratory and education, military and homeland security, and telecommunication sectors. The growth of this market is highly supported by the rising level of awareness among consumers regarding the health hazards caused by exposure to radiation. The increasing number of the government regulations and policies and augmenting usage of electronic support measures (ESMs) are also adding to the market’s growth significantly. In addition to this, the escalating utilization of electronic devices in both, the residential and industrial sectors, is likely to drive the demand for non-ionizing radiation/EMF detection and measurement devices, reflecting positively on this market in the near future. 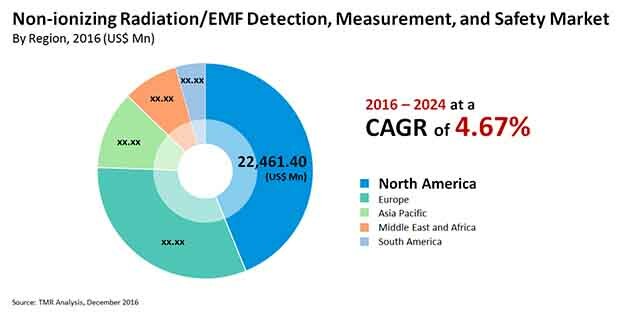 The worldwide market for non-ionizing radiation/EMF detection, measurement, and safety is likely to expand at a CAGR of 4.57% between 2016 and 2024, increasing from US$49.4 bn in 2015 to a value of US$73.8 bn by the end of 2024. In terms of the shipment volume, the market is estimated to cross 547.36 mn units mark by the same time period. Personal monitoring devices, area monitoring devices, and handheld devices are the main types of devices available in the global non-ionizing radiation/EMF detection, measurement, and safety market. Among these, the demand for handheld devices has been higher than others, thanks to the ease of usage they provide. With continual technical advancements, these devices are likely to remain the most preferred ones in this market over the forthcoming years. Analysts project this segment to contribute US$37.9 bn in terms of revenue to the overall market by 2024. Personal monitoring devices are also anticipated to witness a healthy growth rate in the years to come. On the geographical basis, the worldwide market for non-ionizing radiation/EMF detection, measurement, and safety has been classified into North America, South America, the Middle East and Africa, Europe, and Asia Pacific. North America emerged as the leading regional market for non-ionizing radiation/EMF detection, measurement, and safety devices in 2015 with a share of nearly 44% in terms of revenue. The presence of non-ionizing radiation/EMF detector manufacturers in a large number is considered as the main factor behind the growth of this regional market. Analysts expect the North America market to maintain its lead over the next few years, thanks to the technological advancements in this field. Asia Pacific is also projected to experience an increasing demand for non-ionizing radiation/EMF detection, measurement, and safety devices in the near future due to the growing awareness level among consumers. The global market for non-ionizing radiation/EMF detection, measurement, and safety is led by Osun Technologies Inc., WAVECONTROL, Narda Safety Test Solutions, Brightstandz Pvt. Ltd., General Tools & Instruments LLC, Mirion Technologies Inc., TES Electrical Electronic Corp., Spectris Plc, TECPEL Co. Ltd., Sper Scientific, and LAURUS Systems Inc. There has been a substantial increase in the availability and adoption of electronic devices in both domestic and industrial sectors. Increased connectivity of devices and the advent of Internet of Things (IoT) has promoted the growth of businesses being conducted online. The world has been witnessing a huge digital revolution across various industries. Evolution of technology has resulted in the introduction of new electronic devices. In the domestic sector there has been a tremendous increase in the use of consumer electronics. To meet this demand, the global production by electronics and IT industries is expected to grow significantly during the forecast period. Such digital and technological revolution has contributed to the electromagnetic pollution. However, considering the health risks associated, the levels of emissions of non-ionizing radiations at domestic and industrial areas should be in permissible limits. Non-ionizing radiation/EMF detection, measurement, and safety devices play a vital role to limit and control the exposure of such radiations at home and workplaces. The increasing awareness of health hazards associated with exposure to non-ionizing radiation/EMF has driven the demand of devices to detect and measure these radiations. Policies and regulations, surveys, government organizations to monitor radiation emissions play a key role in shaping the non-ionizing radiation/EMF detection, measurement, and safety market. Military and Homeland security and the healthcare sectors are the largest revenue contributors to the non-ionizing radiation/EMF detection, measurement, and safety market. Electronic Support Measures (ESM) in the military and homeland sector drive the demand for non-ionizing radiation/EMF detection and measurement devices. In the healthcare sector, non-ionizing radiation is used for radiation detection, measurement, and also for carrying out medical procedures. This research report provides an in-depth analysis of the global non-ionizing radiation/EMF detection, measurement, and safety market based on detector, device type, end-use, and geography. The global non-ionizing radiation/EMF detection, measurement, and safety market is categorized based on detector into high-frequency detectors, low-frequency detectors, and others. The device type segment for the global non-ionizing radiation/EMF detection, measurement, and safety market is categorized as handheld monitoring devices, personal monitoring devices and, area monitoring devices. The end-use segment comprises of the sectors such as residential, healthcare, military and homeland security, manufacturing, laboratory and education, telecommunication, and others. The report analyzes each of these segments for the various geographies considered under the scope of the study. Based on geographical regions, the report segments the global non-ionizing radiation/EMF detection, measurement, and safety market into North America, Europe, Asia Pacific, Middle East & Africa (MEA), and South America, which are analyzed in terms of revenue generation. The report provides country level revenue for non-ionizing radiation/EMF detection, measurement, and safety market. The U.S., Canada, the U.K., Germany, France, Italy, India, Chain, Japan, Australia, UAE, Saudi Arabia, South Africa, and Brazil, are the countries for which country level estimates are provided in the report. The report also provides value chain analysis and demand analysis for the global non-ionizing radiation/EMF detection, measurement, and safety market. The report includes analysis of the factors that drive and restrain the growth of the non-ionizing radiation/EMF detection, measurement, and safety market. It discusses the prevailing market trends and prospective growth opportunities in the global non-ionizing radiation/EMF detection, measurement, and safety market. It provides market estimates and forecasts for all the segments in terms of revenue (in US$ Mn). Also provided in the report is the competitive landscape of the major players in the non-ionizing radiation/EMF detection, measurement, and safety market. Major business strategies adopted by key players, their SWOT analysis, and competition matrix has also been identified in the research report. The key market players profiled in this study include WAVECONTROL, Osun Technologies, Inc., Narda Safety Test Solutions, Mirion Technologies, Inc., Brightstandz Pvt Ltd., General Tools & Instruments LLC, TES Electrical Electronic Corp., TECPEL Co.,Ltd., Spectris plc, Sper Scientific, and LAURUS Systems, Inc.